1854-55: Collection of 180 stamps, used mostly, with 66 lithographed ½a. blue (Dies I-III), 80 stamps 1a. red (singles and pairs, Dies I-III) and 34 singles 2a. green, with a wide range of colour shades, plate flaws, flukes and retouches, nice and interesting cancellations etc., mostly fine-very fine. 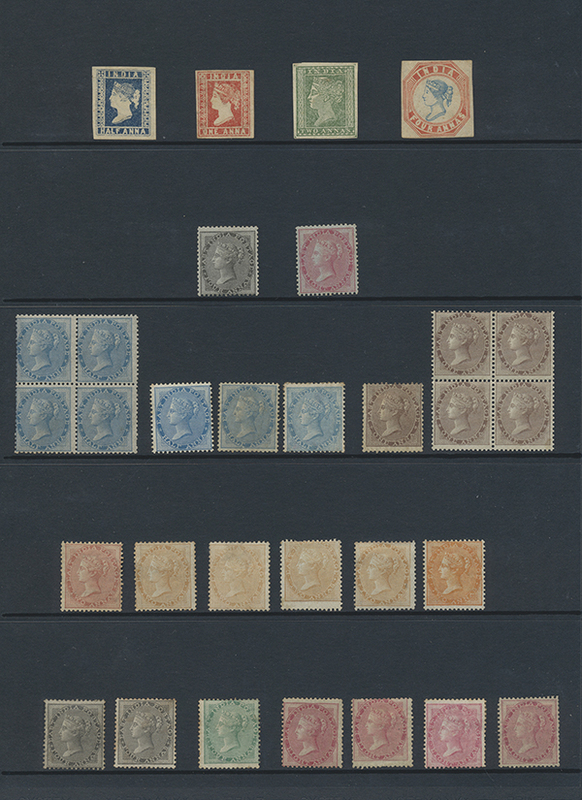 1854-1943: Collection of mint and unused stamps, from 1854-55 set including 4a. (on watermarked paper but Queen's head differs from issued design - a reprint or imitation? ), the perforated stamps with many values and shades of early QV issues, some without gum, others with original gum, plus specials like multiples, West India essays, stamps overprinted "CANCELLED" or "IPN", followed by KEVII. issues up to 25r., KGV. issues up to 25r. plus specials like watermark varieties, Delhi Specimen or ½a. printed double, and KGVI. issues, the Officials with better stamps, colour shades, etc., and last but not least the C.E.F. and I.E.F. issues complete. Some stamps with lightly toned or stained or with shortened perfs but still a good, attractive and valuable collection. 1854-55 Lithographs and 2a. Typo: Collection of about 250 used stamps and 20 covers plus 23 reprints, with 75 stamps + 17 covers ½a. blue (all dies, shades, plate flaws, retouches and flukes, and two early covers used October 5th, 1854), about 60 stamps and two covers 1a. red (all dies, shades, four pairs, retouches, plate flaws etc. ), about 60 stamps and one covers 2a. green (shades, two pairs, 7-8 stamps with almost complete outer framelines), and about 30 stamps 4a. blue & green (various printings, colour shades, 10 stamps cut square, one certificate for 3rd printing which probably is 4th printing, one stamp (3rd printing) cut-to-shape with added margins). The collection is accompanied by 23 essays, reprints and imitations including lithographic transfers of ½a. with two strips of four (blue/brown-red), essay of 2a. green and 5 reprints of 4a., one with blue wavy lines, two with SPECIMEN on back, and two with Queen's head inverted. A very interesting and varied collection with many special details as cancellations, retouches, colours etc. 1935 Mahatma GANDHI: Handwritten postal stationery card by M. Gandhi on the back in which he wrote a friendly text about the visit of the famous Czech Astronomer Karel Hujer (c/o Dr. Jesudason, Christukular Ashram) signed by MAHATMA GANDHI. The card was posted at Wardhaganj on 19th July 1935, sent to Tiruppattur (arrival cds). A rare item which is accompanied by a second card from the correspondence with the autograph of Mahadev Desai, Mahatma Gandhi's personal secretary, dated 26th July 1935, sent from Wardha to Tirappattur and returned. This card was sealed as a refuced letter by paper attached with a new message welcoming Karel Hujer. A GREAT AND RARE PAIR OF POSTCARDS FROM THE MAHATMA GANDHI-KAREL HUJER CORRESPONDENCE. 1854-55 Lithographed 4a. blue & red two singles from THIRD PRINTING (Head Die III, Frame Die I, wide setting, sheet pos. 8+12) used on cover forwarded by Gillanders, Arbuthnot & Co., Calcutta (circled handstamp on back) to JERSEY, Channel Island 'Per "Bombay" steamer', tied with fine strikes of black diamond of dots, boxed "INDIA/PAID" in red and England "PAID/DT/24 SP 24/1855" arrival cds alongside, red "CAL G.P.O./3/AUG/1856" cds and Jersey arrival dater on the reverse. Both stamps cut square with partially cut/touched outer framelines but almost complete to wide margins, good/fine, the cover with a missing portion at top right and a horiz. fold (above adhesives). TWO SCARCE STAMPS USED ON AN INTERESTING COVER. 1854-55 Lithographed 4a. blue & red horizontal pair from 5th printing (6mm spacing, sheet pos. 21+22) used in combination with 2a. green (COMPLETE OUTER FRAMELINES) on entire letter from Calcutta to Genova, Italy 'Per Str. "Oriental"' via Alexandria and 'Per Austrian Steamer Via Trieste' (endorsed in red m/s), cancelled with octagonal numeral "B/1" in black, sender cachet, Austrian/Italian charge marks and red straightliner "D.A.a.L." ("Diretto Austriaco Austriache Lire" applied in Milan) alongside, "CAL G.P.O./4/JUN/1856" double-ring despatch d/s in red and arrival squared d/s on the reverse. The scarce pair from 5th printing was cut-to-shape with almost complete to wide margins, fresh and fine, the 2a. with four margins showing the COMPLETE outer framelines, fresh and fine. An interesting letter with a spectacular and scarce franking. 1852, Scinde Dawk ½a. scarlet on part cover from TATTA, cancelled by diamond of dots (8x8), and with boxed "TATTA / (POST) OFFICE" h/s in red. The stamp with usual cracks and minor marginal chippings but still a good example of this scarce stamp on an original part cover. The postmark indicates the original use of this stamp, which is difficult (or impossible) for most of the Scinde Dawks. AN IMPORTANT ITEM OF THE SCINDE DAWK ISSUES AND OF INDIAN POSTAL HISTORY IN GENERAL. RPSL cert. (signed by one person only) mentioned "... (stamp) did not originate on this piece", while Heddergott certificated "... originally used on piece, genuine in all respects; this item is detectable in trade since 1947"; no statement to pieces by the B.P.A. 1948 GANDHI set to 10r. surcharged "Specimen", Anna values on golden pieces (from folder), the 10r. with first hinge on original white gum, very fine. 1854, Lithographed ½a. blue, Die II, top right corner block of 24 with corner ornament and marginal inscription, unused as issued, with a somewhat creased top margin otherwise fresh and fine. 1854, 2a green COMPLETE RECONSTRUCTED SHEET of 80 used singles mounted on two self-made pages, with various colour shades and cancellations, about 20 stamps show complete (or almost complete) outer frame-lines, and almost all stamps fresh and fine. Ex WADIA collection. 19th century INDIAN POSTMARKS: collection of about 120 covers plus a lot of pieces/single stamps (plus several photocopies) with a great variety of postmarks, even on album pages with detailed description also of the postage rates. This impressive collection starts with pre-philatelic letters from and to India (via Canton, for example), followed by QV franked letters/covers with good multiple or multi-colour frankings incl. India-GB mixed franking, fine letters with 1855 stamps on bluish paper (4a or 8a rate mostly, but also 12a or 1r4a rate to England), uprated postal stationeries, Overland mail, scarce postmarks (as 'Express Letter' or 'PD' Calcutta marks used 1867, ''FF'' in square of bars (Abyssinia Field Force) on QV 1r, sender cachets etc), or the Banghy Dawk ''BANGHY/BOMBAY/.../UNPAID'' large octogon on document. Enjoy the great variety of many interesting items and details. 1838-1991, A lifetime INDIA collection of a German collector with a lot of information written down on more than 3000 pages in 27 volumes even accompanied by used or mint stamps, hundreds of postal stationeries, covers, cards, also photocopies and a lot of further items showing the wide range of India postal history. Starting with some pre-philatelic covers this very interesting collection contains stamps and postal items from a white Scinde Dawk used, a lot of essays (from Lion & Palm to 8a Litograph), Lithographs from various dies/printings and nice items like ½a strip of four on re-directed cover to U.K. or 1a block of six used, further QV issues containing specials like three colour proofs of 1895 2r, Officials (incl. 1866 SG O15 mint and O17 used both with BPA cert. ), some used abroad (Aden, Singapore, Zanzibar etc), a lot of postal stationeries (with four envelopes used from Tranquebar 1902-07, for example), Telegraphs and Fiscals, etc, followed by a similar range of KEVII. issues (incl. 25r used Rangoon), KGV. and VI. stamps, PS's (like Aircraft forms as 3a+1a), covers, etc, further parts of mint and used stamps India from Independence (find a fine marginal 10r Gandhi unmounted mint), C.E.F. and I.E.F. complete series, Fiscals, charity labels, foreign India influenced issues like early Straits, Portuguese and French India examples, and many more. And six volumes contain parts of Indian States with some stamps, and last but not least a stockbook with duplication, some covers as well as some books related to India (in German) were added. A remarkable and recommendable collection. 1948, GANDHI cpl set to 10r overprinted ''Specimen'' in black, mounted on golden cards of 'Indian P&T Dept', 10r with a creased perf at left otherwise fine, and fresh. 1852-1946 British India: Impressive and comprehensive collection of the stamps used (few mint) on pages with description, starting from two fine used examples of the white Scinde Dawk (one BPA cert. ), Essays (Lion & Palm, Queen's Head), the '9½ arches' (BPA cert. ), Lithographed with 'Specimen', 8a proofs, reprints, and specialized sections ½a blue (10 unused and 185 used copies plus 6 covers of all the dies, shades, and partially reconstructed C and D stones), 1a red (unused pair with wmk inverted, 20 used copies and 2 covers incl. all dies/various stones), 2a green (4 used copies and cover), and 4a blue & red (22 copies (8 cut square) incl. 4 examples of 2nd print on piece, 3rd printing (BPA cert. ), etc). The perforated QV stamps include the unissued 1856-64 2a used (SG 50, little repair, BPA cert. ), 9 examples of 1866 ovptd Foreign Bill stamps, varieties (inverted wmk), the Officials with small Service ovpts, the 1866's (incl. 6a, SG O17, BPA cert. ), SG O37, etc and 'I P N' and 'Postal Service' stamps. KEVII., KGV. and VI. issues including KE 25r (PAR used), the 'Delhi' Specimen, Officials, and varieties like four variations of the 'Bird flaw', reversed serif on 2nd 'I' of 8a Air or uncatalogued sideways wmk on KGV. 1½a (RPS cert). A substantial and recommendable collection. 1948, GANDHI: Specialized collection of 140 FDC's, covers and cards bearing Gandhi adhesives (ex SG 305-308) including a dozend with the 10r. Allmost all different including 54 FDC's (9 with complete series to 10r, on various types of illustrated envelopes, scarce cancellations as Pondicherry, etc), censored, registered and airmail covers to USA, Europe or Asia, and a lot of specials like mixed franking of Tibet ½t orange with Gandhi 1a on cover from Lhasa to Nepal via Pharijong, other registered covers from Pharijong, covers from Nepal, mourning covers, complete marginal set with sheet numbers and 'Gandhi Nagar, Jaipur' d/s, slogan 'May God Grant Peace To All' in various types, and many other interesting details. This phantastic and breathtaking lifetime collection (built during decades by an European Gandhi admirer) represents a unique union of good to superb, scarce and rare Gandhi covers showing a great diversity. An extraordinary offer. 1948, GANDHI complete set of four in top corner blocks of ten (2x5), very fine mint never hinged (a thin in margin's corner of the 10r not affecting stamps). A most attractive quartet. 1852, ½a red Scinde Dawk tied by small diamond of dots to fragment. This is the first stamp of Asia and a great rarity. In order to prevent from it being reused, this stamp was made out of wax so that it cracks upon usage. As such, out of the handful of examples that exist, most are found heavily cracked and mounted to a different piece to which they do not belong. This example is in an excellent state of preservation with minor cracks, on the original piece of the letter to which it belonged. A great rarity. APS certificate. 1854, 4a deep blue and red (4th printing) horizontal cut-square pair on cover from Calcutta to Genova, Italy, cancelled with ''B/1'' in octogons and red framed 'INDIA/PAID', endorsed 'P Bombay / via Triest' and red 'D.A.a.L.'' straightliner alongside, red Calcutta despatch cds, blue sender double oval and red boxed ''GENOVA ARRIVO 13 FEB 56'' ds on reverse. A fine pair of fresh colours with full to wide margins around on a most attractive cover VIA TRIEST! 1854, 4 anna blue & pale red Head I Frame I (SG 18) unused with wavy lines on three sides and rosettes at foot with grease mark on back and two minute natural paper pinholes not detracting from the beauty of this seldom seen stamp with such attractive margins. BPA certifcate. 1854, India's most famous stamp - The 1854 4 anna blue & pale red Head I (position 1) Frame I (position 12) with major error "Head Inverted" (SG 18a), Williams "Rare & Famous Stamps, Vol.2", example H, cut to shape with clear to good margins all around, horiz bend and and a trace of thinning at foot (mentioned for accuray) cancelled with a fine strike of the rare "Hollow Diamond of Dots" in red. The Hollow Diamond of Dots is generally associated with usage in the Straits Settlements. This example is arguably the rarest copy of the famous "Head Inverted" - a Classic Indian Rarity. BPA certificate. 1854, India's most famous stamp - The 1854 4 anna blue & pale red 1st printing Head I (position 10) Frame I (position 3) with major error „Head Inverted” (SG 18a), Williams „Rare & Famous Stamps, Vol.2”, example XXVII, cut to shape with small tear at foot (mentioned for accuracy) cancelled with Bombay circle diamond of nine bars - a Classic Indian Rarity. BPA certificate. 1854, 4 anna blue & red with error - watermark inverted and reversed (SG 19) an unused copy with exceptionally large example with wavy lines on three sides with fresh bright colours, minute traces of staining removed at top and faint vertical crease neither of which are visible from the front (mentioned for accuracy). BPA certificate. 1854, 4 anna blue & red 2nd printing Head II Frame I with major error "Head Double" (SG 19a) cut to shape (as is the case with all three recorded copies) with margins intact nearly all around neatly cancelled with diamond of dots, small light mark below neck (mentioned for accuracy). It should be noted that only three copies are known of this great rarity - this being the finest example and arguably one of the greatest rarities of Indian philately. This stamp was pictured in the Martin & Smythies book. BPA cerificate. 1854, 4 anna blue & red 2nd printing Head II Frame I with major error "Frame Double" (SG 19var) cut to shape with traces of margin in places, cancelled with diamond of dots with part cds in red on top. This is the only recorded example, of this major error in private hands being discovered in 1983 - arguably the rarest Indian stamp. RPS certificate. 1854, 4 anna blue & red 4th printing (SG 23) unused horizontal pair (position 14-15) with margins all around, minor spots at upper left not detracting from the beauty of this appealing unused multiple - multiples of unused 1854 4 annas are extremely rare. BPA certificate. 1854, 4 anna red and blue 5th printing Head III Frame II (SG 25) position 7 unused with unusually large margins all around with a prominent retouch of the Queen's profile and nose (previously unrecorded). A superb copy with rich colours. Sismondo certificate. 1854, 4 anna blue & red Head III Frame II with pin perf all around (SG 30) neatly cancelled by Arcot "C/124" in diamond of dots. A great rarity of which only three eamples have been recorded - this being the finest known copy; illustrated on plate 7 of the Martin & Smythies book. BPA certificate. 1840, ONE OF THE EARLIEST COVERS FROM INDIA TO BEAR AN ADHESIVE: 9th May EL sent from Calcutta "per Tory" to London with m/s "1/4" (crossed through) and on reverse m/s "3/6" (crossed through) and "SHIP LETTER" h/s. The EL arrived in London on 31st Oct. 1840 to be redirected to Haddington and franked with 2d plate 1 JC (faults) reaching Edinburgh on 2nd November. A fantastic example of a cover travelling during the PRE-ADHESIVE & ADHESIVE PERIODS, ex Angus Parker. 1854, 2a green horizontal strip of four on cover from Madras to St. Austle/Cornwall, tied by black diamonds of dots, with red crescent ''INDIA PAID'', red framed ''MADRAS/G.P.O./1854 DE 9'', endorsed 'Stamped/Steam/Via Southampton' and red English ''PAID/1855/22 JA 22/AQ'' arrival cds alongside, black St. Austle open cds (JA 25) on back. A perfect strip of four with wide margins around (traces of outer framelines) on fine cover with clear postmarks. An extraordinary and most attractive cover. 1948, 'GANDHI' Specimen: complete set to 10r overprinted SPECIMEN (in greyish black)on two separated golden pages of presentation booklet ''Indian Posts and Telegraphs Department / Mahatma Gandhi Memorial Stamps / 15th August 1948'' (inscr. in red), the Anna values adhered on sheet, the 10r mounted mint with original gum. 1794-1860s ca., ''The Handstruck Postage Stamps of India'': impressive and comprehensiv collection of more than 110 covers (a few franked, pre stamp mostly) showing the wide range of postmarks (oblongs, ovals etc. in red or black mostly, recorded as well as many Giles unrecorded types), from Ajmer to Sagor, with a lot of scarce covers, types and destinations like CHINSURA/Dutch India and many more most interesting and scarce covers. 1804-1854, famous collection ''HAND STRUCK POSTAGE STAMPS'' with 33 selected pre stamp covers, every item a special one, mostly scarce/very scarce. The impressive collection contains, for example, early covers and postmarks from Bellary (1821), Agra, Patna, Kircumbady, Soldier letter 1831, Express letter 1843 Calcutta-England, early Steamer letters and many more most interesting items. Recommendable! 1855 (Jan 15), cover to Hobard/VAN DIEMANS LAND (TASMANIA), bearing 1854 2a green, strip of 5, good margins, tied by diamonds of dots, m/s 'via Ceylon & Singapore', m/s 'Stamped 10 ans', red s/l 'INDIA PAID' and 'PAID', and framed rectangular ''SHIP-LETTER-INWARDS-FREE / 9 JU 9 / 1853'' (date error) alongside, on back with framed despatch ds, red Calcutta transit cds (17 JAN 1855), and similar SHIP-LETTER ds in red rhombus. A spectacular franking and destination. 1855, cover to Hobard/VAN DIEMANS LAND, bearing four copies of 1854 2a green (strip of 3 & single) and 1a red (Die I), good margins, tied by diamonds of dots, m/s 'Per trial opportunity', m/s 'Stamped', red framed 'INDIA PAID' and 'PAID', and framed rectangular ''SHIP-LETTER-INWARDS-FREE / 17 MR 17 / 1855'' alongside, on back with red despatch ds, red Calcutta transit cds, and similar to front SHIP-LETTER ds in red rhombus. A spectacular franking and destination. 1855, cover to England with 9a rate mixed franking of 1/2a blue (Die I), 1/2a blue (Die II), two copies of 2a green and cut-to-shape copy of 4a blue & red (Head Die II, Frame Die I), tied by diamonds of dots and red English ''PAID/6 JA 6/1856'', red framed Madras G.P.O. transit ds, m/s 'Per Steamer Via Madras and Southampton' and 'Misdirected England' (Ramsgate instead of Kent) alongside, and with (H)amandroog Paid despatch ds, blue transit cds and blue Ramsgate cds (7 JA 1856) on reverse. A most attractive franking. 1852-1946, A lifetime collection of British India and India Used Abroad assembled over a span of 50+ years by a very discerning specialist who has a great eye for the unusual & extraordinary items. A very neaty written up on album pages housed in 12 albums. Starting with 1852 white and blue Scinde Dawks, 1854 Lion & Palm essays, Queen Victoria Gothic heads, 1854 essays of the 1/2a., 1a., 2a., 4a. & 8a. (incl. Die proofs), the unissued 9 1/2 arches, detailed studies of the lithographed stamps of 1854 showing the different Dies, stones, flaws & retouches, shades, multiples (f.e. blocks of 16 with inscribed sheet margins), 1854 4a. including 15 cut-square copies (2 from 3rd printing), pairs, strip of three and a pair (2nd printing) together with pair of 1/2a. on cover. Also a very special study of more than 200 reprints between 1855 and 1894 (f.e. 4a. in pair with inverted head). QUEEN VICTORIA 1855-1900: special study of all the different stamps with many important items, like 4a. bisected on cover used 1859 in Singapore (Cert. BPA) or the unissued 1856 2a. yellow-green in pair used postally with ''B-1'' octogon cancel, a lot of proofs as Die proofs of 1r. 1874, plate proofs, essays or colour trials of the 1894 Rupee values and SPECIMEN also, add. some major varieties as double prints and more. KEVII. issues to 25r. with 'CANCELLED' ovpt, essays of the 1925 provisional surcharges on the Rupee values, or three different booklets from 1906-07. KGV. and KGVI. with multiples (incl. corner marginal block of 10 of 4a with ''STAR'' sheet wmk, several booklets (1911-1926), multiples ovpt 'CANCELLED', special study of the 'NINE PIES' ovpt (incl. scarce essays, the 'NINE NINE' and 'PIES PIES' errors or double ovpt), rare proof of the 1925 1r. Delhi SPECIMEN, varieties like misperforations or double (kiss) prints, and the red booklet KGVI. containing the 1937 issue to 1 Rupee. The next part of this unbelievable collection contains the OFFICIALS, from the 1866 no wmk stamps with varieties like different 'no stops', a wonderful 1884 'Government reprint' of a COMPLETE 1966 2a. Foreign Bill ovptd ''SERVICE'' (Cert. BPA), multiples, SPECIMEN, imperfd marginal pair of 1a. chocolate (1922), strips optd ''CANCELLED'', and surcharge varieties as double, inverted or on back. Further parts containing extended studies C.E.F. and I.E.F. with scarce varieties and covers, Telegraph stamps (with the complete 1a. and 2a. of 1881), Field post and P.O.W. mail, Airmail with the lovely 1911 Allahabad cancel in red, f.e., Rocket mail, and some special items like pigeon messages, war fund labels, Chalo Delhi stamps or a Azad Hind study. Last but not least a main part India Used Abroad in four albums, from ADEN (f.e. with ''124'' numeral on cut-square copy of 1854 4a., a phantastic telegram or rare cancels like 'PAQUEBOT ADEN', PERIM and negative seal of Bogus type) to ZANZIBAR, also with SINGAPORE, DUBAI, BAHRAIN, BAGDAD, TIBET and most of the other known cancelations. A wonderful and extraordinary lifetime collection with rarities and unique items - so it will be doubtless impossible to assemble a similar collection today. WONDERFUL!